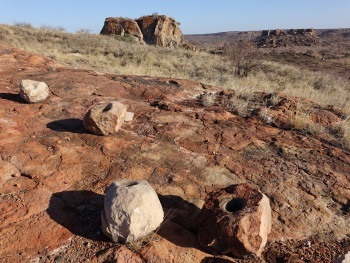 Mapungubwe Cultural Landscape covers the remains of what once was the most important inland settlement in Southern Africa. Its inhabitants traded ivory and gold with the Swahili towns at the Indian Ocean shore. Three main phases of development from between ca. 900-1300 AD have been uncovered here. The settlement moved to a different location each time. A sacred royal leadership evolved, in which the royals came to distinguish themselves from the commoners by living in a secluded palace on Mapungubwe Hill. Mapungubwe has been abandoned in the the 13th century, after a sudden change in climate and/or losing its role on the trade routes. It was only rediscovered publicly in 1932, when the findings of stone walls and graves with golden objects and traded Chinese ceramics made the international news. Mapungubwe Cultural Landscape lies at the northern border of South Africa, adjoining Botswana and Zimbabwe. This remote setting probably accounts for its low profile and limited visitor numbers, even among World Heritage Travellers (ranking 830th out of 1052). In the nomination file it was noted that although many WHS have to deal with high numbers of visitors, the sustainability of Mapungubwe is threatened by attracting too few of them. What I found however was a well-cared-for National Park, worth anyone’s visit for a day or so. On my first two half-day trips into the park, I focused on game drives and brushed up my mammal list total: I saw mongoose, klipspringer, southern giraffe and steenbok for the first time. The park isn’t teeming with wildlife: there are no fences between the park and the adjoining zones in Botswana and Zimbabwe, so the animals migrate a lot between the three countries. Also the density of mopane bushes makes it hard to see smaller animals. But especially the dramatic landscape, with lots of old baobab trees, ridges and canyons makes the park attractive. Mapungubwe was a large inland settlement that pre-dates the much better-known Great Zimbabwe. There’s a hint of Kernave to its story: the chief with his close allies lived in a palace on the hill, whille the common people inhabited villages below. In its heyday in the 13th century, the society is believed to have consisted of 9,000 people. While large parts of the park can be explored with your own car, that hill (Mapungubwe Hill) is only accessible with a guided tour from the park office. These 'Heritage Tours' are conducted 3 times a day, and I booked a spot on the 4 p.m. tour about two hours before. I was the only participant. The flat-topped hill where the archaeological findings have been made lies in a startling green part of the park. Vegetation shows that a river flowed here in the past, so the Mapungubwe people had chosen their spot well. After a short drive we left the jeep behind and continued on foot. The guide was carrying a gun: this is lion and elephant territory. Mapungubwe Hill is where the royal family withdrew at a given time, and where three graves with precious objects have been uncovered. It is a natural fortress, the walls are so steep that no one could approach unseen. From photos that I had seen beforehand I thought it would be a single outstanding inselberg – but in fact whole Mapungubwe National Park is full of this kind of eroded hills. At neither of the two game drives I had recognized Mapungubwe Hill. In the past there was only one way up, via a ladder. We used the same approach. It took some 10 minutes climbing steep stairs (modern wooden ones fortunately), and then we were on the summit. Although naturally flat, it was made more inhabitable by the former residents by adding sand to it. They (the women apparently) took it from the valley below. The top still is covered with a layer of sand with grass, convenient enough to build your hut. The only visible remains are circular cutouts in the soft red sandstone. There is also a water tank and a granary. Water and grains were obviously provided to the royals by the ordinary people 'from below'. In 2011 a museum opened at the park to show the Mapungubwe findings. But they have not been very succesful since to lure away artifacts from the University of Pretoria Museum where most are stored. Mainly glass beads and ceramics, evidence of the position of the Mapungubwe Kingdom at the Indian Ocean trade route, are shown. The most spectacular of the discoveries is a little gold rhinoceros, made of gold foil and tacked with minute pins around a wooden core. I already had made plans to go and see it in Pretoria on my way up north, but it turns out that the Golden Rhino just moved to the British Museum on a temporary loan! It’s the first time that this symbol of post-Apartheid South Africa has left the country. There’s a copy on show in the Mapungubwe museum. Though it is the nearest heritage site for me to visit, i find it more unbelievable that i am situated next to that place. Mapungubwe is an exciting place to visit because of its climate conditions, the natural well being, and environmental factors such as low pollution, absence of gaseous substances which affetcs the atmospheres. these factor makes the place a healthy site to visit, and even stay. the world did not make a mistake by honouring the place the world heritage site. its just 90 kilo away from me...as i am situated at musina. Mapungubwe is a special and sacred place, I have had the honor to go on top of the mountain several times and each time you discover something new about the amazing history, myths, legends and culture that lay hidden in the mountain. It is great climbing up the mountain through the entrance that was once a long time ago a secret entrance hidden by a wild fig tree, its the only way to get on top of the mountain. There is a rope now but long ago there was none and the people who lived there were really clever and made a ladder by grinding holes into the rocks on opposite sides and putting sticks on each side. It great climbing up there (just wear the appropriate clothing}. Mapungubwe National Park is only accessible by car. It lies some 50km north of the last town in the very north of South Africa, Alldays. The road is paved (including potholes).